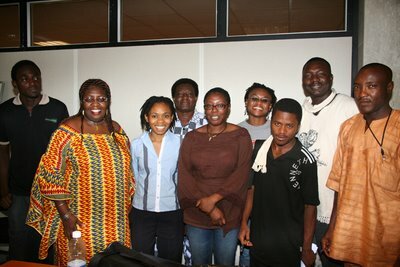 The two-day writing workshop in Abuja ended yesterday afternoon. The participants thoroughly enjoyed the course. The party now moves on to Lagos, for a book reading at Bookworm this afternoon, with Church visits etc tomorrow, followed by various tv appearances and another workshop in the next few days, with the grand finale being a trip to Accra next weekend. Its an incredibly tough slog getting a publishing company off the ground in Nigeria. Bibi needs to sleep for a week. She has been a star, as has Abidemi. The fellow in a black tee-shirt to the left of the picture and behind everyone else, is his name Donald?